The weather in my town has finally started to cool off a bit. I know that it is just an early tease, but the temperature for the past few mornings really put me in the mood for some hot tea. Which reminded me, I really want to make myself a tea cozy for my tea pot like the tea cozy I made for my sister-in-law earlier this month. I went to my stash to find just the right fabrics and snapped a quick photo to put on Instagram. I was already considering turning this post into a tutorial, but I got a request for instructions through Instagram, too. So without further ado, here is a quick and easy tea cozy tutorial! To begin with, you will need to know the approximate size of your tea pot. My tea pot (shown above) is large: it can hold 48 ounces / 6 cups / 1.5 liters. I made the Large version of the tea cozy to cover my tea pot. 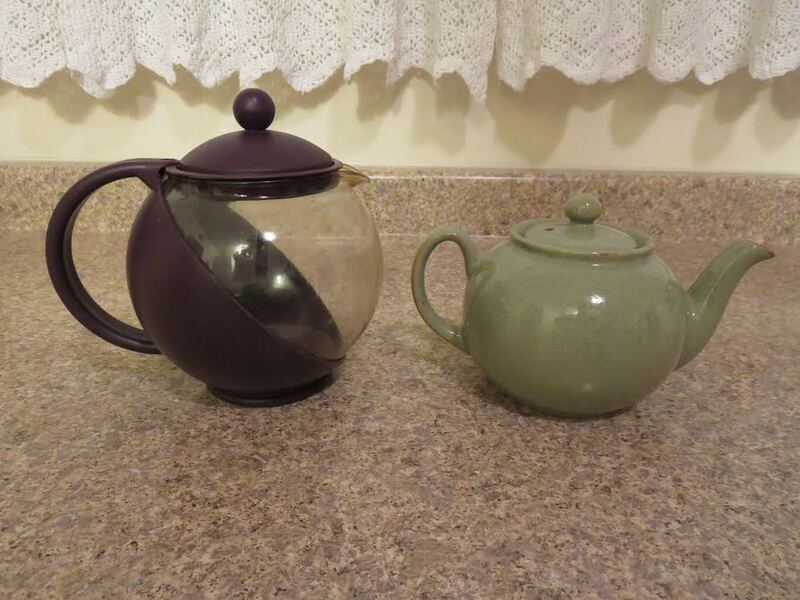 Two smaller tea pots that my sister-in-law uses are shown above. The glass teapot is 28 ounces and the green one is 20 ounces. 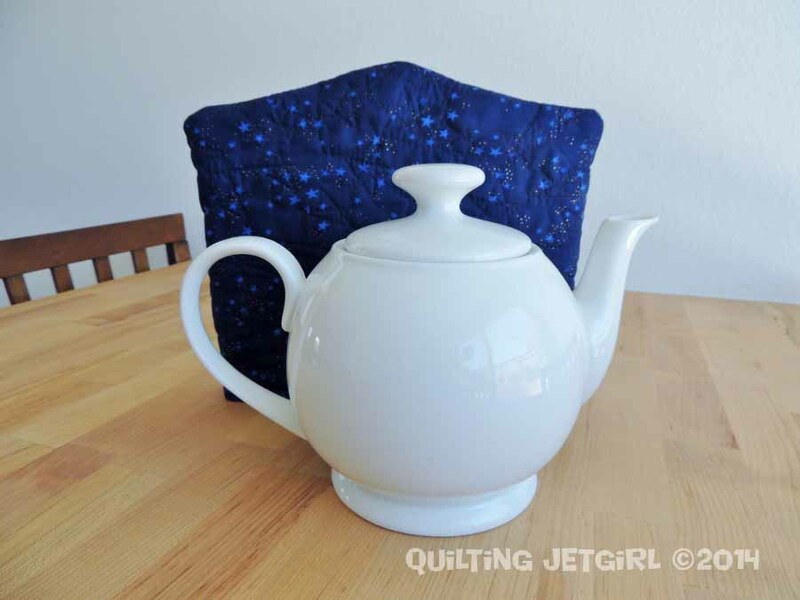 If your teapot is in this size range, make the Small tea cozy. 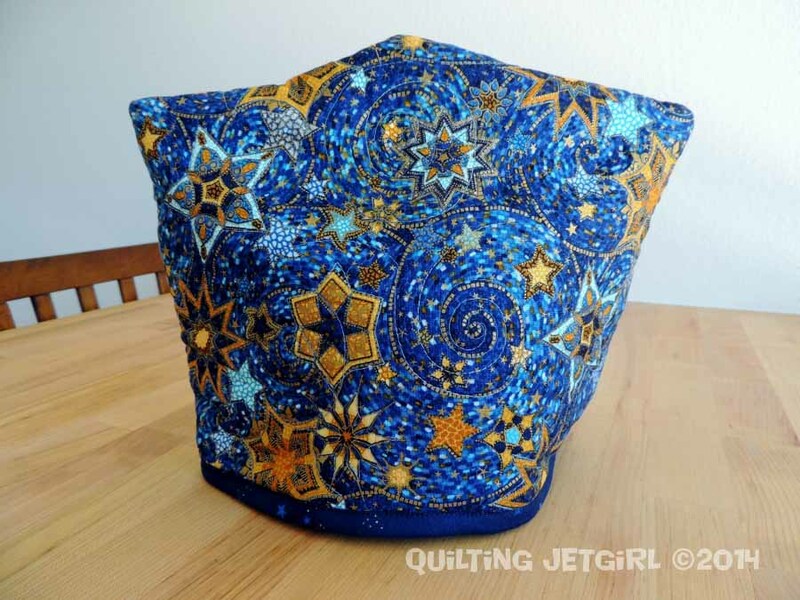 The directions in this tutorial are for a fully reversible tea cozy, so selecting 2 fabrics to represent different holidays, color themes, or materials that you love could be a really fun way to extend the life and use of the tea cozy. 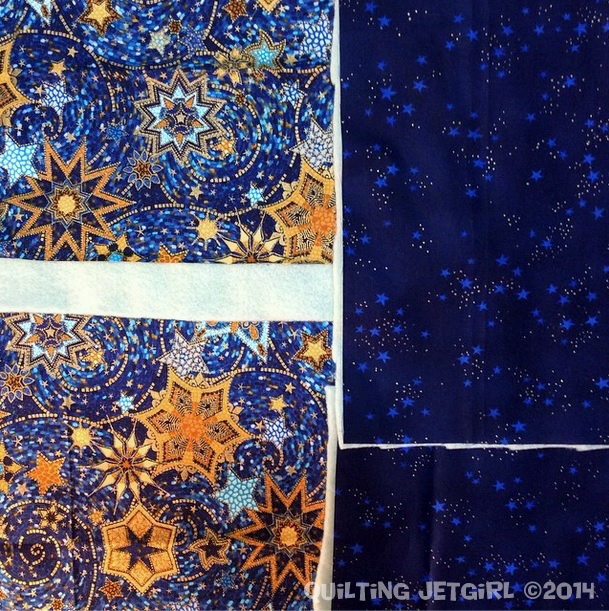 I will be referring to two different fabric sets during the tutorial and I have chosen to note them as the Inner Fabric and the Outer Fabric, although once assembled, either fabric may be on the inside or outside! 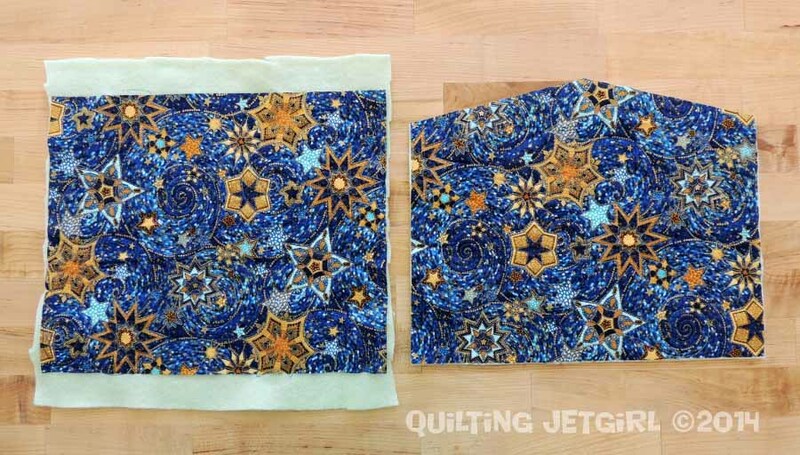 I suggest quilting a pattern on each of the inner fabric panels before assembling them together to form the inner liner for the tea cozy. 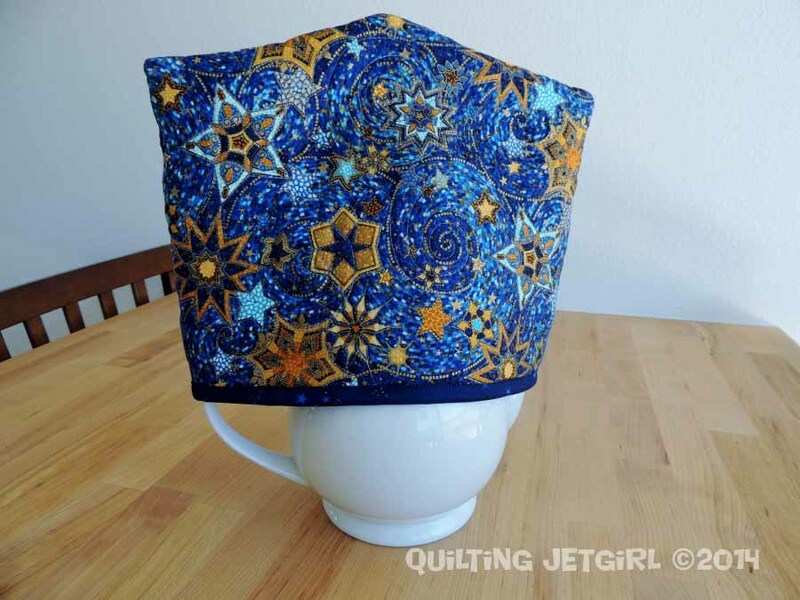 This will help stabilize the fabric to the batting and be especially nice when you flip the tea cozy inside out to change the look. Large: Measure 6″ down the longest edge and 1.5″ down the shortest edge. 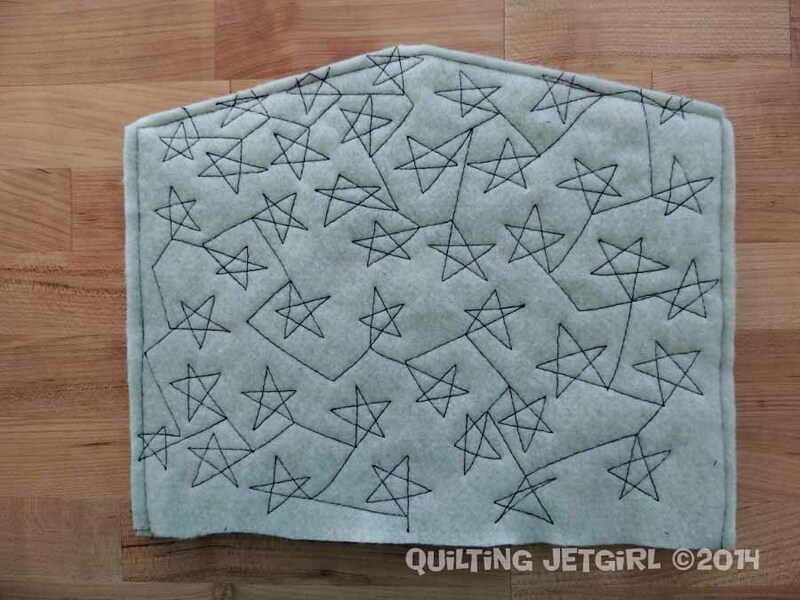 Trim small triangle and repeat on opposite side (refer to image above for clarity). Small: Measure 5.625″ down the longest edge and 1″ down the shortest edge. Trim small triangle and repeat on opposite side (refer to image above for clarity). 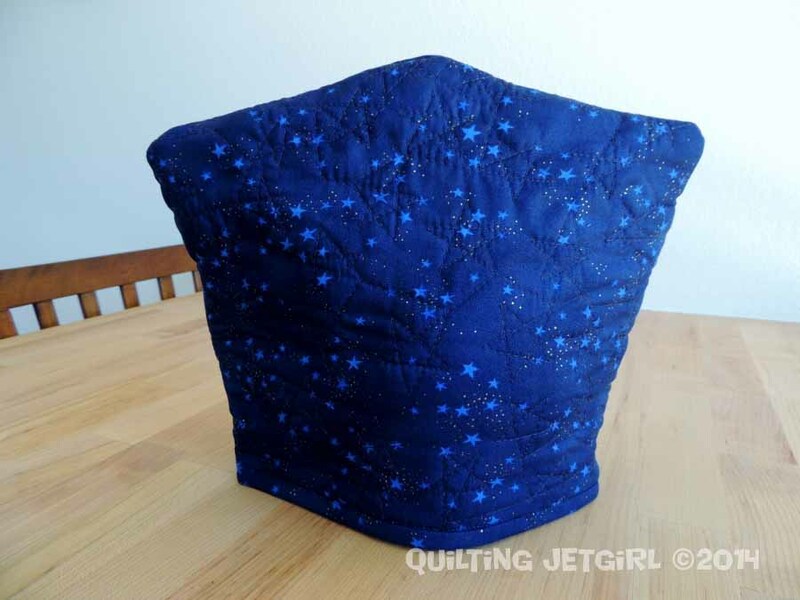 With right sides together, sew a 3/8″ seam allowance to assemble the inner liner for the tea cozy. Start at one short edge away from the trimmed corners and stop at the same spot on the opposite short edge, leaving the long straight edge open to create a “pocket”. 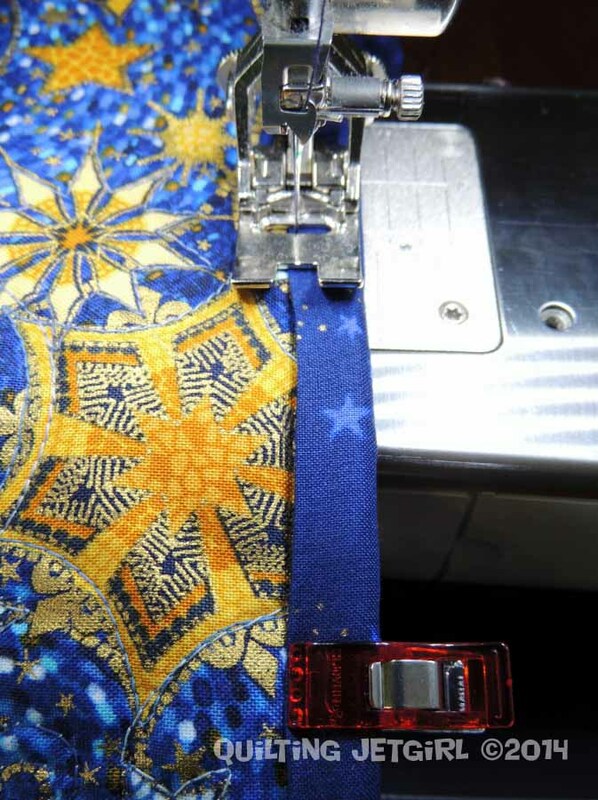 After the seam is complete, trim the seam allowance down to between 1/8″ and 1/4″ to reduce bulk. I also clip the corner fabric a bit to ease the ability to turn the pocket right side out later. 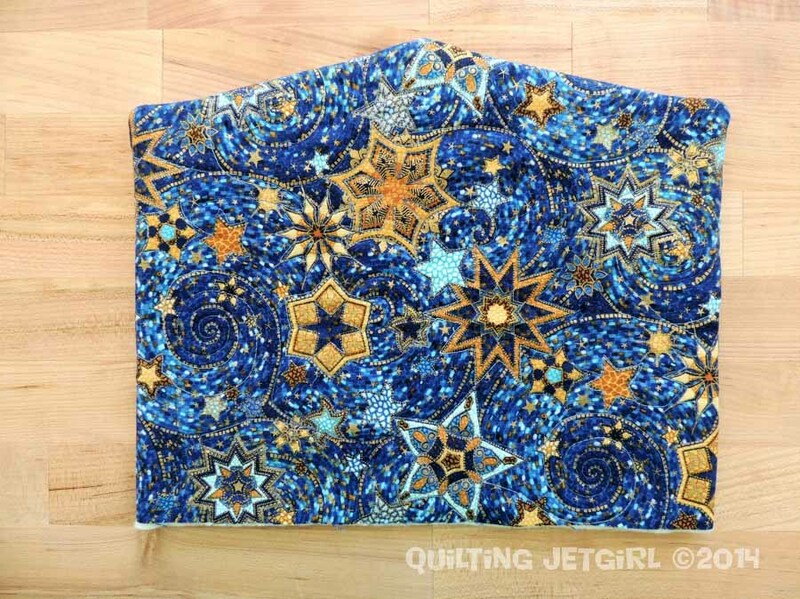 Just like for the inner panels, I suggest quilting a pattern on each of the outer fabric panels before assembling them together to form the outer liner for the tea cozy. 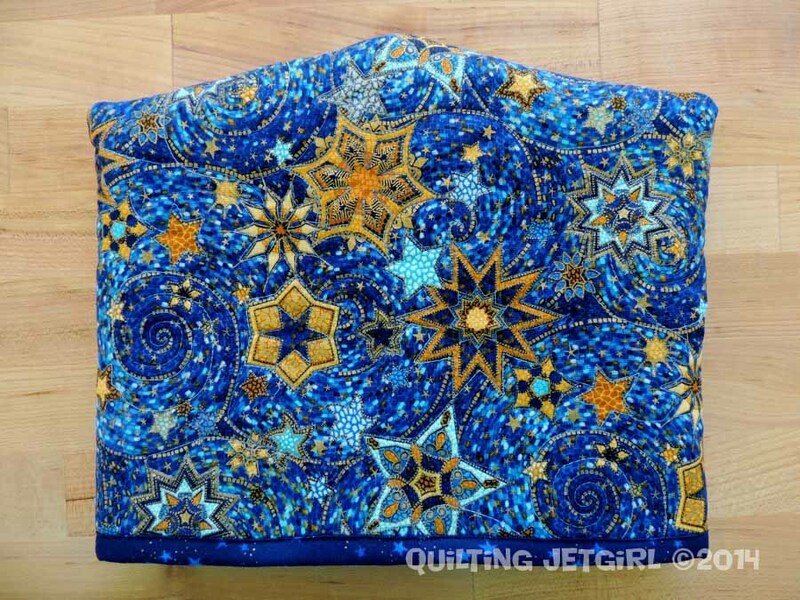 This will help stabilize the fabric to the batting and be especially nice when you flip the tea cozy inside out to change the look. 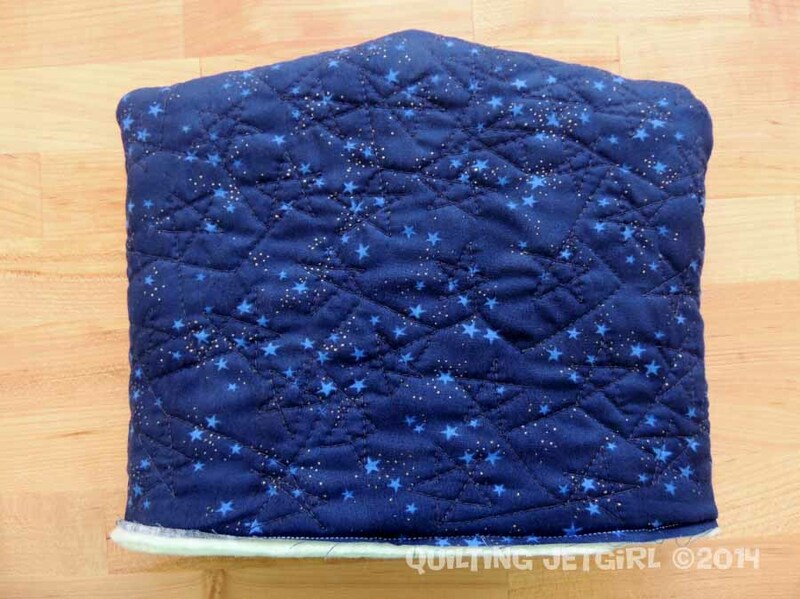 With right sides together, sew a 1/4″ seam allowance to assemble the outer liner for the tea cozy. Start at one short edge away from the trimmed corners and stop at the same spot on the opposite short edge, leaving the long straight edge open to create a “pocket”. After the seam is complete, I clip the corner fabric a bit to ease the ability to turn the pocket right side out later. Gently turn the outer liner right side out. I do not back-stitch at the start and end of my liners (although it might be better practice) because I know the seams will be caught by the final binding around the raw edge. Therefore, this is the most tricky step in terms of need for patience and a gentle touch. I also spend some time getting the corner points to pop out well. Ease the inner liner into the pocket of the outer liner. The two layers of batting will be touching on either side. Once the inner liner is inserted into the outer liner, sew the raw open edges of the two liners together using a 1/4″ (or scant 1/4″) seam allowance. 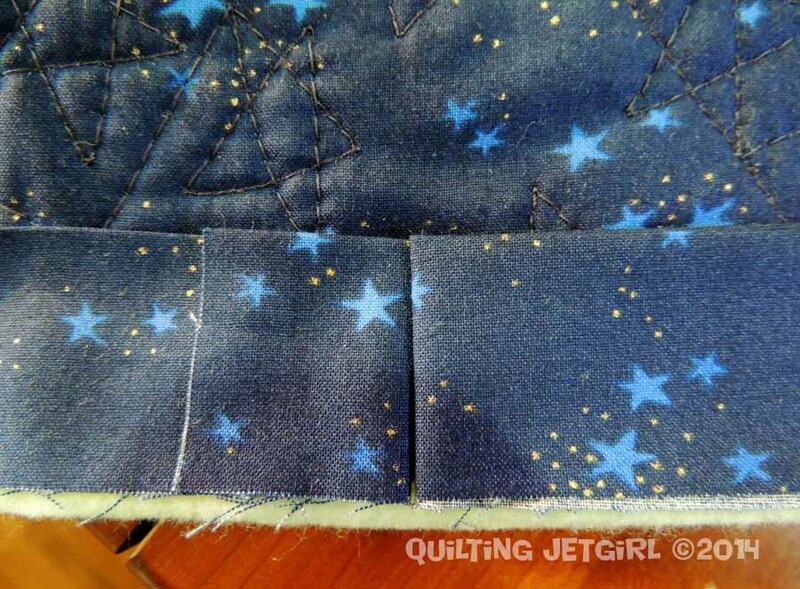 I used slightly smaller than a 3/8″ seam allowance when attaching the first edge of the binding down. I leave a “tail” on the binding when I start and I tried to make sure that the tail would land in about the middle of a long edge of one side of the tea cozy. A trick that I picked up somewhere is shown in the two photographs above. 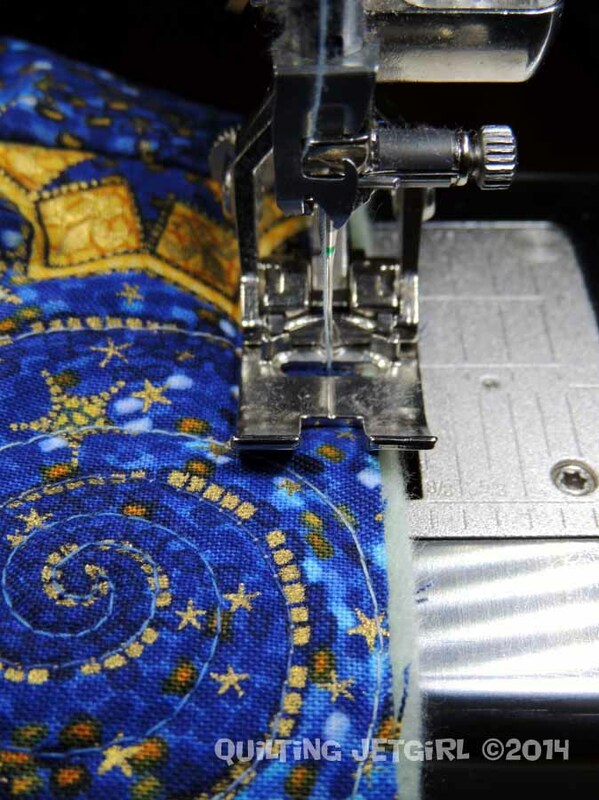 After sewing down the binding and stopping short in the same manner that you start long, fold back the binding at a central point and press the fabric firmly along the fold line. Use these creases to sew the two ends together (right sides facing), trim excess binding fabric, and finish attaching the binding around the edge. 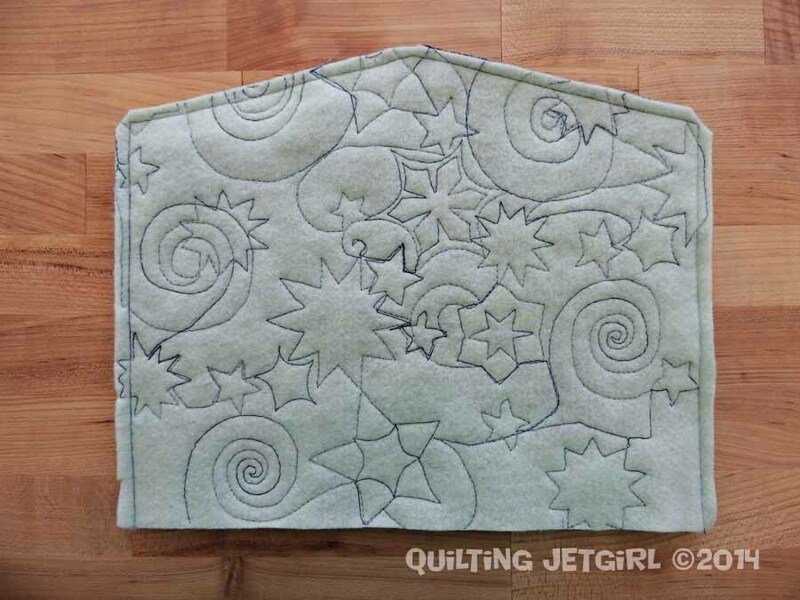 This technique is great for smaller projects like this tea cozy, quilted placemats, or mini quilts. 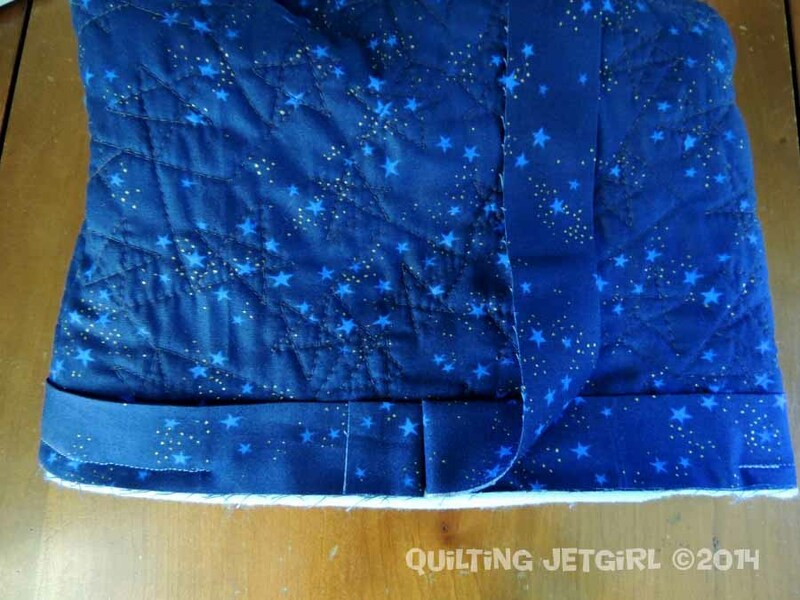 I like to use mitered (45 degree cut) binding seams for larger quilts, but there just isn’t enough room for that on smaller projects. Once the binding was fully attached, I flipped the binding across the seam and pressed it to help get it to turn to the other side in the next step. For such a small item, I really find the use of clover clips to be a life saver for this last step. They take a very small amount of time to use and have really made my machine binding much more crisply finished. Congratulations! 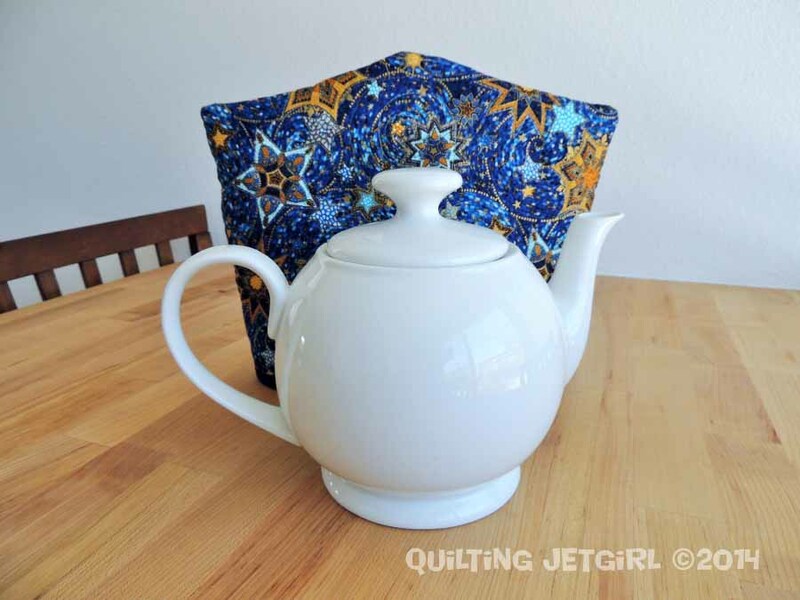 You have just made a completely reversible tea cozy! I would love to know if you create a tea cozy using this tutorial. 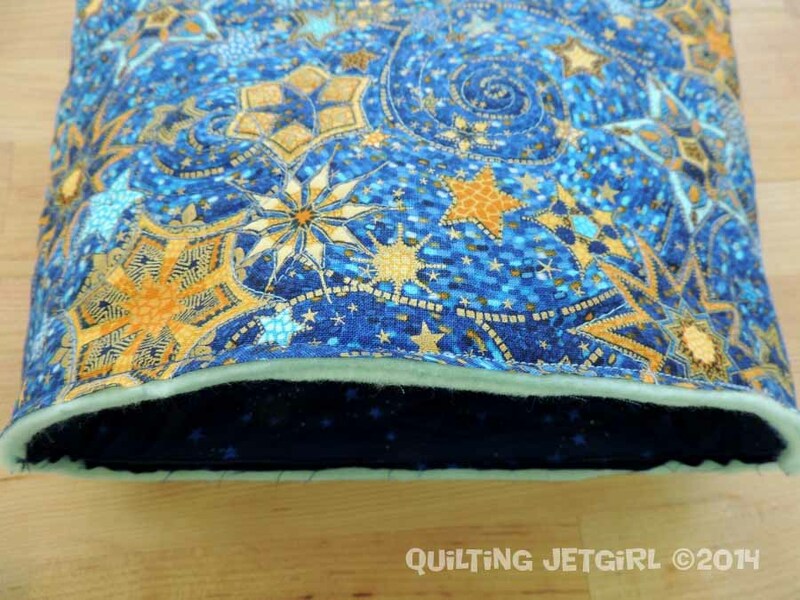 If you are on Instagram, please tag me (@quiltingjetgirl) or send me an email (jetgirl8 (at) gmail (dot) com) to a link to your blog post if you finish a project. Of course, please email me with any questions or problems you might run into while trying to follow my tutorial. I chose to use double batting for this project to really help insulate the tea pot. 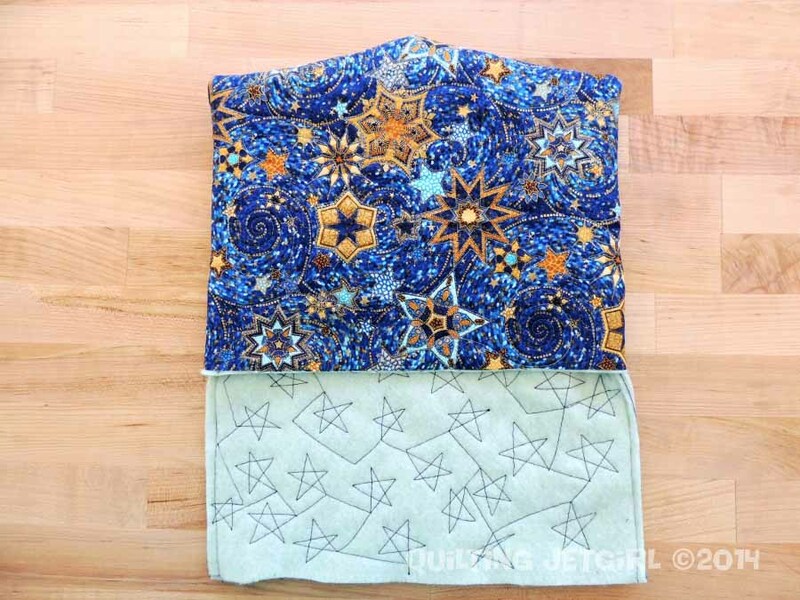 If you are not interested in a reversible version of a tea cozy and the double batting, simply make a quilted panel of outer fabric / batting / inner fabric, quilt, sew right sides together, and bind. This will make a single layer, non-reversible version of the tea cozy. And because it is so much fun, here are a few “action” shots of my new reversible tea cozy in use! Ha ha! 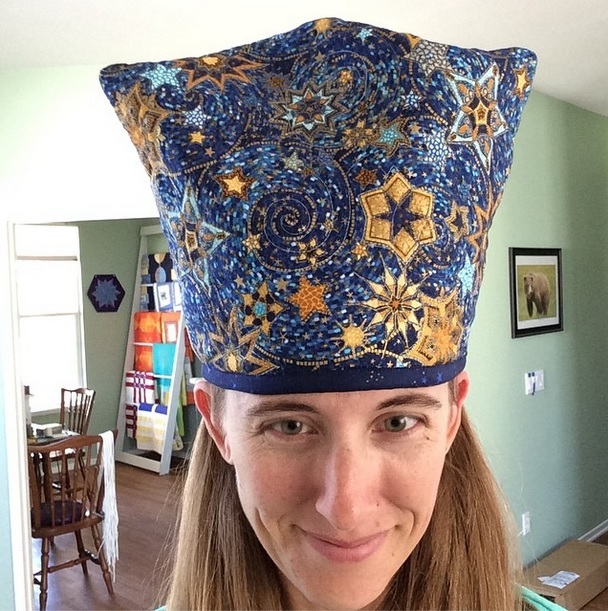 Tea cosy or bishop’s hat! Love it! It looks great, we’re not tea drinkers so I need to think of someone who needs one of these as a gift. Great tutorial! Very clear and wonderful pictures. I loved the picture at the end too! as a hat it would fit right in with a Christmas pantomime like Aladin! Thanks for the tute, I really have to make one of these – w’re had the same tea pot for 9 years and no cosy yet! Pingback: Handmade Holidays Nov. 21: Gifts for Cooks | Sew Mama Sew | Outstanding sewing, quilting, and needlework tutorials since 2005. Pingback: Handmade Holidays Nov. 13: Gifts for the Cook | Sew Mama Sew | Outstanding sewing, quilting, and needlework tutorials since 2005.